A SOLID gold 1p coin is set to fetch more than 20,000 its face value when it goes under the hammer at a Tyneside auction house. It may be small change but the sought-after 1p is expected to coin it in at Newcastle’s Anderson & Garland Auctioneers. The penny is part of a gold proof set made especially by the Royal Mint to mark the 2002 Golden Jubilee. The full set contains a complete collection of UK currency coins in gold - 5GBP, 2GBP, 1GBP, 50p, 20p, 10p, 5p, 2p and 1p. The set also includes a collection of the Queen's Maundy money in gold, which are four coins representing the old 4d, 3d, 2d and 1d. The set, belonging to a North East collector, has already attracted much attention from eager coin enthusiasts and is tipped to sell for between 4,500GBP and 5,500GBP at the auction on Tuesday 5th March. Anderson & Garland Director Fred Wyrley-Birch said: “This is a beautiful set of gold coins, which I’m sure will prove very popular. 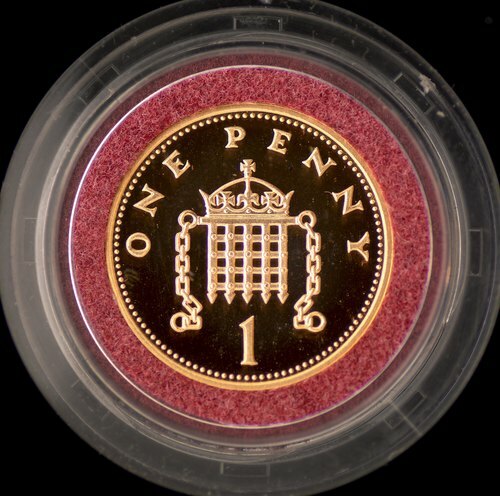 The weight to value ratio of the 1p coin in particular is of interest as it’s made from solid gold and has a scrap value of 200GBP but if you were to walk to the shops to spend it, 1p is all it would be worth. “Being solid gold, it’s highly collectible and worth much more than 1p – 20,000 times more, in fact. Established in 1840, Westerhope-based Anderson & Garland is a leading firm of fine art auctioneers and valuers in the North of England and the Scottish Borders and one of the largest independent auction houses in the UK. It holds approximately 40 auctions a year, including specialist categories such as British and European pictures, modern art, Asian works of art, silver, jewellery, ceramics and glass, coins, watches, clocks, scientific and musical instruments, militaria, furniture, works of art, comics and sports memorabilia. This press release was distributed by ResponseSource Press Release Wire on behalf of Sarah Hall Consulting in the following categories: Retail & Fashion, for more information visit https://pressreleasewire.responsesource.com/about.